Q: When do you need our investment? A: We need 60 investments immediately, with checks in hand. This is one commitment from each family in our program. Please speak with friends and family about getting on board. Q: Is our investment transferable? A: yes, your investment is transferable, if both parties (Buckeye and investor) agree. This is very helpful should you choose a team fee credit and then get transferred out of the Columbus area. Q: Where are our investment dollars going? A: The initial wave of investment will be applied towards the purchase of our pool. The initial deposit is currently due. A: We are working on a site that would be central to Olentangy School District. However, we are negotiating with a few different parties and will entertain any property in the Southern Delaware or Northern Franklin County area. Q: Can I make multiple investments? A: Yes, a family can invest more than once and can choose different maturity dates of their investment. We are looking for a total of 60 investments in this first wave. Pierce Bateman shows off his unique pre practice warm-up. Buckeye is in charge of concessions at the Katy Callard Invite. Please take a moment to look over the list of items we need donated and the volunteer opportunities. You can easily sign up to help via Sign Up Genius. Thanks to all of our incredible parents for your outstanding support!! Red Bull, Rock Star, Amp, Monster Energy—enticing labels for a tired and thirsty swimmer. Energy drinks are one of the fastest growing segments of drink sales in America and their popularity is growing, especially among youth. Athletes use energy drinks to rehydrate after a workout, boost attention and focus during school, “wake up,” or as a routine beverage at meals. Don’t be misled by something that sounds too good to be true—while an all-in-one drink is tempting, it carries some serious considerations for young athletes. According to the American Academy of Pediatrics (AAP), children and teens should avoid energy drinks. Confusion exists about the difference between a sports drink and an energy drink, so let’s clear this up. A sports drink contains a small amount of carbohydrate, minerals, electrolytes and flavorings and is designed to replace those nutrients lost through sweating after exercise. Gatorade is an example of a sports drink. Energy drinks contain stimulants including caffeine, guarana and yerba mate (herbal stimulants) and taurine (an amino acid). Ginseng, if present, enhances the effects of caffeine. Other elements may be added to energy drinks, but their benefits, safety and side effects are questionable. An average energy drink contains 70-200 mg caffeine per 16 ounces. Some energy drinks can contain up to 500 mg of caffeine, the equivalent of 14 cans of soda. For children and teens, caffeine consumption should be limited to 1.25 mg per pound of body weight (for a 100-pound swimmer that’s 125 mg caffeine per day). More than 100 mg of caffeine per day in adolescents has been associated with higher blood pressures. Growing children and teens should avoid excess caffeine consumption. Excess consumption of caffeine is associated with agitation, anxiety, poor sleep, rapid heart rate, increased blood pressure and altered mental states. Too much caffeine can mask fatigue. Gauging fatigue is important to staying fit, healthy and in the pool. If jacked up on caffeine, swimmers may miss the body’s signal for rest. Caffeine can alter mood and behavior, resulting in physical dependence or addiction. How do you know if you’re a caffeine-addict? Without caffeine, you experience withdrawal symptoms such as headache, tiredness, depressed mood and nausea. If that’s not enough to make you re-think your drink, here’s some more food for thought. Energy drinks contain sugar—up to 30 grams per cup (almost ¼ cup of sugar). Limiting sugar consumption is a healthy practice, for any growing child and teen, whether an athlete or not. Energy drinks are dehydrating. Due to the concentration of caffeine, energy drinks encourage frequent urination, and energy drinks with higher sugar content can compound the dehydrating effects of caffeine. Feeling tired, losing focus and struggling with low energy? Rethink your nutrition, hydration and sleep program. No magic bullet replaces a nutritious diet of real, wholesome food, adequate water and other healthy liquids, or a good night’s sleep. And that’s no (red) bull. Jill Castle is a registered dietitian and child nutrition expert. She is the owner of Pediatric Nutrition of Green Hills and creator of Just The Right Byte, a child and family nutrition blog. Jill lives with her husband and four children (one swimmer!) in Nashville, Tenn.
Our team has been selected to participate in the Home Team Advantage Program this season at the Polaris Buffalo Wild Wings. Throughout the winter season, any family that eats at BWW should show their "Teammate Card" and BWW will donate 10% of your receipt (alcoholic beverages excluded) to our Boosters! Bring your Teammate Card into the Polaris Buffalo Wild Wings, before the expiration date. Details are on the back of the card. Show your card to your server and let them know you are part of the Home Team Advantage Program. The server will add your table's food sales to our team's running total. It's that easy! At the end of the season, Buffalo Wild Wings will donate 10% of the sales that our entire team generates throughout the season. Buffalo Wild Wings is a proud sponsor of the community and the local sports teams within it. The BWW goal is to help make this community the best place to live, work, play and dine. Buffalo Wild Wings believes in supporting local schools and sports organizations. Sports build loyalty, ethics and teamwork, as well as provide the framework for a successful community. BWW wants to help keep our community working and playing together. Please pick up your Teammate Card from Coach Laurie this week. We were given 100 key ring cards and 50 credit card size cards to hand out and thus do not have enough to put two in everyone's mail folders. 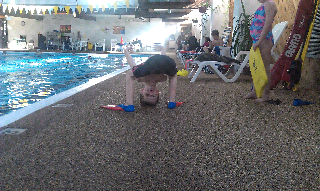 We are looking for a parent that has experience drilling in concrete to set the anchors for our new starting blocks. Your time spent will be fairly credited to your team fees. Please reply to this email if you can help. Limit Hot Tub use to 5 minutes. PARENT SUPERVISION is REQUIRED for any swimmer in the hot tub. NO adults and siblings in the coaches and swimmers prep area please. All adults and sibling should utilize the seating along the south and east side of the pool. Children not in practice must be supervised at ALL times. Please speak with coaches prior to the start of practice or when the coach has finished their groups for the day. Please avoid interrupting a coach during practice time. Thank you to everyone for helping us create a positive and productive learning environment for our swimmers. The most recent set of meet invoices were emailed on Thursday. These invoices are auto generated via a nifty little Excel add on. However, this add on is not able to turn on the online payment feature for these invoices. This must be manually checked within QuickBooks. If you would like to pay a meet invoice online, you can simply pay what is due within your team fee invoice (and I will then change the payment to post to your meet invoice) OR email me and I can turn on the online payment feature. CARSIDE to GO is included in this event!! Please plan to pick up or dine in at Applebees on Tuesday - this event directly benefits our Boosters. The boosters provides a lot of great things for our kiddos and coaches including: the two new blocks that will shortly be installed at Columbus North, our team banquet (boosters provides the DJ & dessert), assisting our swimmers in National travel expense (each meet is typically $750-1200), assisting our coaches in travel to out of town meets, supporting our coaches education and swimmer DVD library, providing technology for coaches. We will have a few schedule changes later this month. No practice Saturday and Sunday of the Dayton meet, Nov. 19-20. 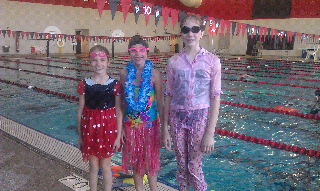 Weds 11/23 and Friday 11/25 of Thanksgiving all groups will swim in the 11:30-4:30 timeframe. Details will be out early next week. Will Indest is shown here learning the ins & outs if officiating at the UA meet. 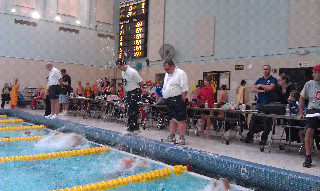 Buckeye Swim Club Swim Team merchandise has been updated and is now on the Kast-A-Way Swimwear Web Site. Your swimmers can log on and purchase their already discounted team merchandise, as well as all the other items we carry, right over the web. Your Team should now be listed on the left side of your screen under Team Affiliations. You can now list more than one team under your account as well as view your past order history. We hope that this will now make purchasing your team appointed merchandise easier than ever. Only those that have the user name and password can access the team page.